This Place of Worship was founded in 1826, and we understand it is still open. 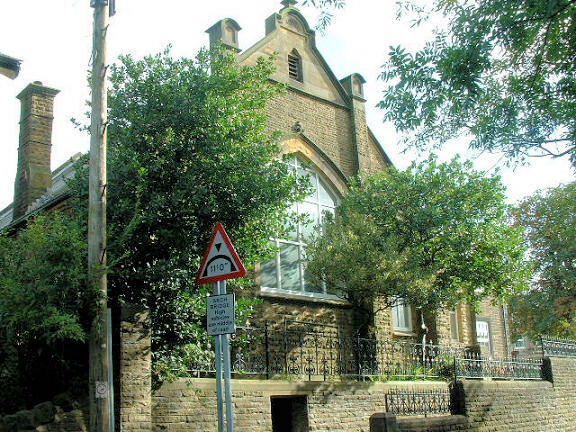 The foundations of Brierley Green Congregational Church were laid in 1826, originally as a day- and sunday-school, where the minister from Chinley Chapel held regular services. A meeting-house certificate for its use by Independents was issued in May 1827, and the school remained in an undenominational trust until it was purchased by Congregationalists in 1890, who erected the present chapel building in 1906-7, attaching it to the west end of the school. The original building, with stone walls and slate roof, was formerly entered through a round-arched rusticated doorway at the east end. The return to the Religious Census of 1851 (HO 129/450/2/6/28) for "Bugsworth School Room" records a separate building, erected in 1826 for an Independent congregation, and used exclusively as a place of worship. It had seating for 110, all free, and it had an average congregation of 30 attending evening service (no mention of Sunday Scholars). The return was completed by Ebenr. [Ebenezer] Glossop, its Minister, who gave his address as "Chinley near Chapel en le Frith". Brierley Green Congregational Church, Bugsworth (Buxworth) shown on a Google Map. Places of Worship in Bugsworth shown on a Google Map. I have found many websites of use whilst compiling the information for this database. Here are some which deserve mention as being of special interest for Bugsworth (Buxworth), and perhaps to Local History and Places of Worship as a whole. Information last updated on 23 Dec 2014 at 08:45. Please also remember that whilst the above account may suggest that Brierley Green Congregational Church remains open and accessible, this may not remain so. This Report was created 28 Mar 2019 - 21:55:52 GMT from information held in the Derbyshire section of the Places of Worship Database. This was last updated on 6 Feb 2019 at 15:49.